At Countertops by Artistic Fabrications, Inc., we want to make the interior of your project, residential or commercial, just as beautiful as the Colorado Land it is built on. We have been doing so since 1989 for countless residents and contractors all across the Front Range. 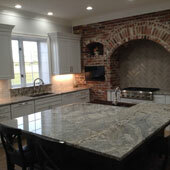 We do this by installing some of the most creative and attractive solid-surface, granite and quartz countertops. Today, kitchens and baths are places to live well and reflect your sense of style. Kitchens are no longer just cooking spaces, they're gathering places. Baths are not just function-oriented, but places of practical luxury. The addition of new countertops can greatly enhance these spaces. Give us a call or visit our showroom today to see what we can do to enhance your interior living and work spaces!